This bathroom 15w LED switched wall light in chrome finish is very bright and rated IP44. Modern streamlined design, with rounded body fitted with an opal white polycarbonate shade and chrome end caps. 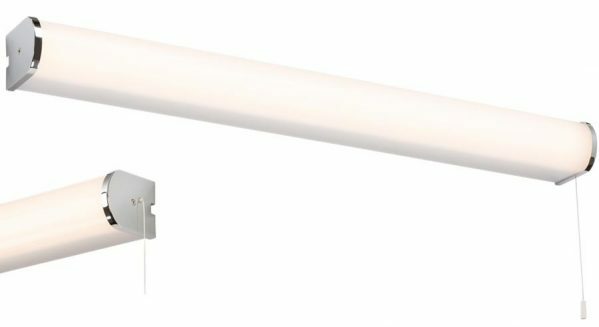 High output 1300lm and fitted with a pull cord switch, making it ideal for use as a standalone wall or bathroom over mirror light. Mains voltage and energy efficient, this fixture is ideal for a modern or traditional bathroom. It has been specifically designed for use in bathrooms but can be used anywhere inside your home except wet rooms. Supplied with integral energy efficient warm white LED lamps, rated IP44, fully splash proof and suitable for bathroom zones 1 and 2.